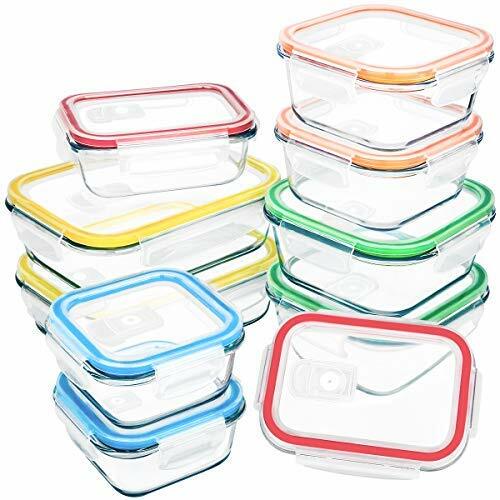 CRAZY LOW PRICE on 10 Piece Glass Food Storage! FREE Shipping! Use coupon code N36TQII4 for $14.40 off! PREMIUM QUALITY BOROSILICATE GLASS:Our glass food storage containers are made from high quality borosilicate glass, which is stronger and can hold up to temperature changes much better than cheaper glass food storage containers.Completely safe for use in the oven, microwave, freezer and refrigerator (Not the lids).Oven safe for over 450°F.These glass container set is dishwasher safe and easy to clean. AIRTIGHT & LEAKPOOF GLASS STORAGE CONTAINERS:Snap locking lids with silicone gasket seals are designed to keep food fresh for longer periods.The silicone sealing ring is removable and easy to clean.The lids of glass food containers also feature an air vent for microwave use. Airtight closure make the glass storage containers spill free. SAVE TIME AND MONEY - Just prepare food ahead of time or store leftovers in our glass bento box, then pop them in the oven or microwave to enjoy a home-cooked meal anywhere - at home, office, school and gym. Convenient& Healthy! MEAL PREP OR STORE LEFTOVERS - Featuring multiple sizes and colors, the glass bowls with lids can be used for food storage and transport, meal prep, restaurant and deli takeaway, portion control, picnics and camping. 100% SATISFACTION GUARANTEE: If you receive cracked products or you are not 100% satisfied with our products, please feel free to contact our customer service. We will provide the best solution to refund or resend within 24 hours.